Their name means “With honor on the Sea of Grass”. Roaming the Plains south of the Green Lands, the Sha’Kae al’Dan are a horse culture that worship Vulkar, the Great Wind Stallion. drakkar: the method of birth control on the Plains. Unmated warriors drink a cup every day to prevent conception. Women do not often drink drakkar because it’s a powerful aphrodisiac. Had-Mangus: the formal name for the assassins, or Death Riders, that kill in Vulkar’s name. Literally, the “Right Hand” of Vulkar, or the Hand that Wields the Rahke of Sacrifice. Touch the Sky is a free read detailing how the Death Riders were first Called to sacrifice by Vulkar. kae’al: a token of honor, typically colored beads or rings that are worn in the warrior’s hair or in bracelets about his arms or legs to symbolize the warrior’s entire kae’valda. Kae’Had-Mangus: the most honored Death Rider on the Plains, the assassin who has sacrificed the most blood to Vulkar and leads the others. kae’rahke: a rahke challenge between two warriors. Warriors may fight simply for blood and honor, but if formal challenge is given, they fight to the death. kae’valda: honor. Warriors live and die by their honor, visibly displayed for all to see by the kae’als in their hair and the color of their memsha. Honor can increase or decrease on a daily basis, for everything is a competition on the Plains. memsha: a brightly colored cloth worn about a warrior’s hips, usually the only clothing the men wear. The color is significant and unique to each warrior, often called kae’valda, which represents his honor. The color of the memsha is given when a lad becomes a warrior. memshai: the female equivalent of the memsha, typically worn with a loose comfortable vest. A woman may wear any colors she prefers, but a mated woman typically wears her warrior’s kae’valda to honor him. na’lanna bond: a unique, rare bond formed between a warrior and his woman, heightened through shared blood, that ties their hearts and minds together. According to legend, a warrior will be able to find his na’lanna anywhere on the Plains if they’re separated. Few mated couples actually share a na’lanna bond. rahke: a six-inch knife and the main weapon of honor on the Plains. Although warriors do fight with swords, the honor is less than a battle fought with rahke only. Vulkar, the Great Wind Stallion: He sired the Sha’Kae al’Dan with His own blood after He battled the Endless Night and drove the Shadow away from His Plains. Someday, the Endless Night will darken the Sea of Grass once more. When Vulkar Calls His people in the Last Days and leads them to battle, His Coming will burn the world. The Dark Mare: The Great Wind Stallion’s mate, a white mare with a black mane and tail. She rose from the Silver Lake at the foot of His Mountain and healed Him after the epic battle against the Endless Night. The Endless Night: An insiduous Shadow from the north that spreads death and corrupts all He touches. If He breaks free of His prison, the sun will never shine again. Each camp is lead by a khul and roams the Plains as needed to graze the na’kindren. One khul is elected Khul through a special battle, the Kae’Khul, and leads all Nine Camps as much as possible. However, the Sha’Kae al’Dan waged war against the Green Lands generations ago when outlanders stole na’kindren, and since that time of Loss, the Nine Camps are broken. Each Khul hopes he will be the one to reunite all Nine Camps under solid leadership, a task which must be accomplished before the Last Days, or the Endless Night will destroy the Plains forever. The Sha’Kae al’Dan are one of three major peoples in the Blood and Shadows world. 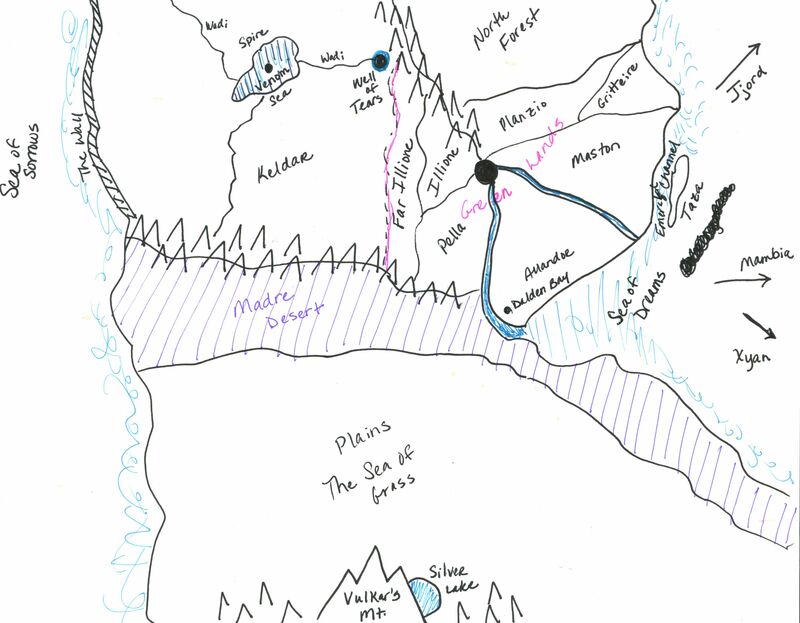 I’m no cartographer, but here’s a rough hand-drawn map showing the relationship of Keldar, the Green Lands, and the Plains of the Sha’Kae al’Dan.